Deputy Prime Minister and Minister Kim Dong-yeon of the Ministry of Strategy and Finance shakes hands with US Secretary of Treasury Steven Mnuchin during their meeting in Washington, DC on April 22. (Photo: MOSF). The 51st Annual Meeting of ADB's Board of Governors, which is slated for May 3-6 at the Asian Development Bank (ADB) headquarters in Manila, will bring together over 3,000 participants, including finance ministers, central bank governors, and private sector representatives. Deputy Prime Minister and Minister Kim Dong-yeon of the Ministry of Strategy and Finance (MOSF) will head a Korean delegation to the annual meetings. The delegation includes the governor of the Bank of Korea and heads and representatives of commercial banks, including Shinhan Financial Group, Kookmin Financial Group, Hana Financial Group, NH Financial Group, Woori Bank, Korea Development Bank, IBK, and Korea Eximbank as well as representatives of other financial institutions and the financial industry, including the Korea Financial Investment Association. The meeting will look at global and regional issues affecting development in Asia and the Pacific, while exploring how ADB and its development partners can work together toward a prosperous, inclusive, resilient, and sustainable region by 2030, it said. Various other events will be held during the Annual Meeting in Manila, including seminars focused on addressing the gender gap through women’s entrepreneurship and economic empowerment; the private sector's increasing role in meeting Asia's huge infrastructure needs, estimated at $1.7 trillion annually until 2030; new technologies in finance; investing in community-led solutions for climate and disaster resilience; and promoting inclusive growth through inter-subregional cooperation. Meanwhile, the Asia Infrastructure Investment Bank’s (AIIB) third Annual Meeting will be held in Mumbai, India on June 25- 26. The Korean economy continues to grow thanks to the private sector's rising consumption, but the overall pace of the Korean economy is limited by the weakening of economic growth momentum from exports and a decline in investment. Inter-Korean summit talks and subsequent summit talks between North Korea and the United States will take place on April 27 and May, respectively, under the so-called Olympic detente, which was launched during the 2019 PyeonChang Winter Olympic Games in February. The summit talks are forecast to greatly ease geopolitical risks on the Korean Peninsula, which will likely have a positive impact on economic entities, such as the improving of consumer sentiment, investments and consumption. In addition, if the current government’s policies, including the improving of household income, a reduction of working hours, and the improving of the quality of employment pay off, some experts said, they are expected to expand the private sector’s consumption, riding on a rise in household disposable income. Deputy Prime Minister Kim embarked on a visit to the United States on April 19 to participate in G20 Finance Ministers and Central Governors and International Monetary Fund Committee (IMFC) Spring Meetings, to be held in Washington until April 21. DPM Kim is to meet with IMF Managing Director Christine Lagarde and U.S. Treasury Secretary Steven Mnuchin respectively. Currency issues, including how to improve transparency of the government’s action in foreign exchange markets are expected to be taken up as topics during the meetings. The United States has been demanding the Korean government to make public details of its foreign exchange market intervention. A currency report issued by the U.S. Treasury on April 13 called for Korea’s disclosing of details of actions taken by currency authorities in Korea in a transparent and timely fashion. The Korean government maintains a principle of intervention to smooth foreign exchange market volatilities, but does not disclose it. Asked whether Korea was considering disclosing details of its current market intervention at a meeting with reporters on April 16, DPM Kim said Korea has currency sovereignty, and decisions would be made under a principle of keeping currency sovereignty. During the trip, DPM Kim will meet with President Luis Alberto Moreno Mejia of the Inter-American Development Bank to discuss on youth technology volunteering projects. He will also have a meeting with President Jim Yong Kim of the World Bank Group to discuss ways of the group’s hiring Korean manpower. He will also have meeting with ranking officials of Moody’s, Fitch Group and Standard & Poor’s to ask them to give Korea stable national ratings. “Job markets have been sluggish as the economy added a little more than 100,000 jobs in February and March, respectively. Furthermore, young adult job growth plummeted in March from 44,000 in February to 4,000 in March. This slowdown in the job market, contrary to the view that the minimum wage increase is to blame, is mainly due to the industrial restructuring underway, as well as a high base effect from a year ago. Employment by small businesses improved in March compared to the previous month. “To improve job markets, particularly those for young adults, the government has submitted the 2018 supplementary budget plan to the National Assembly, along with a tax revision bill. We expect the supplementary budget to successfully support projects designed to create young adult jobs and stimulate local economies hit by restructuring, and ease young adult unemployment by 1-2 percentage points this year. The Korean economy continues to recover, backed by strong exports, the MOSF said in a news release. 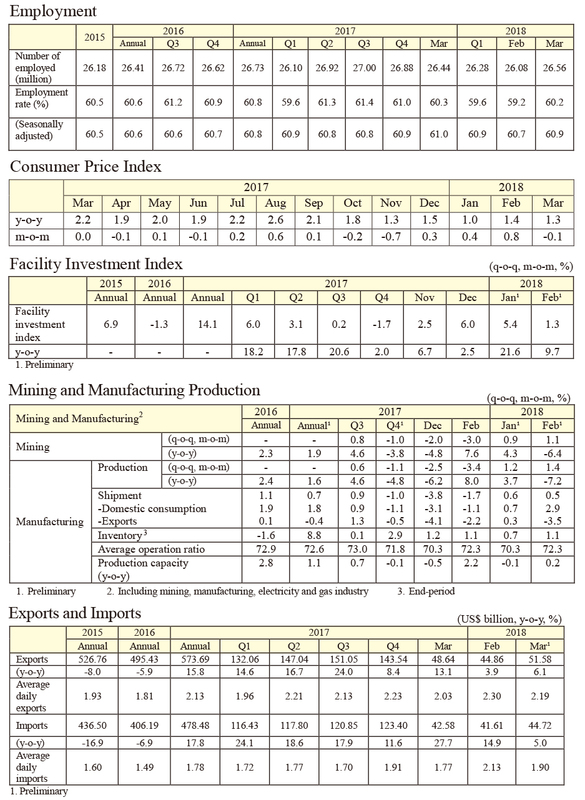 Mining and manufacturing production, consumption and facility investment continued to rise. The economy added 112,000 jobs year-on-year in March as manufacturing and construction continued to be strong and the service sector employment rebounded. The young adult unemployment rate rose from 11.3 to 11.6% YoY. Consumer price inflation was 1.3 percent in March, rising even more slowly compared with 1.4 percent in the previous month, due to low agricultural product prices and public utility rates, as well as steady petroleum product prices. Industrial production stayed flat in February, up 1.2% MoM. Mining and manufacturing production increased for the second consecutive month, up 0.9% MoM due to strong automobiles and semiconductors. Service output stayed flat, 0.8% MoM as transportation & storage services declined and meanwhile wholesale & retail and healthcare & social welfare services increased. Retail sales increased in February, 1.3% MoM, backed by semi-durable goods, such as clothing, and nondurable goods, such as food. Facility investment rose for the fourth consecutive month in February, up 5.4% MoM due to strong investment in transportation equipment. Construction completed fell, down 3.8% MoM, despite an increase in civil engineering works, due to a drop in building construction. In February, the cyclical indicator of the coincident composite index rose 0.1 points from the previous month to 99.9, and the cyclical indicator of the leading composite index fell 0.2 points to 100.6. Exports increased for the 17th consecutive month in March (up 6.1%, y-o-y) backed by strong major export items, such as semiconductors, amid recovering global economies. In March, KOSPI rose after fluctuating amid concerns over North related risks and the spread of protectionism, and the dollar-won exchange rate fell as concerns eased over North related risks. Government bond yields fell, despite the Fed’s rate hike, due to rising concerns about trade conflicts between the US and China. Housing prices increased at a slower rate in March (up 0.20% ⊥ up 0.12%, m-o-m) as housing price growth slowed down in the Seoul metropolitan area. Jeonse (lump-sum deposits with no monthly payments) prices continued to fall (down 0.09% ⊥ down 0.13%, m-o-m) as the prices in Seoul’s southern districts slipped. The economy is expected to stay on a recovery path backed by improving global economies. However, unemployment has been rising and external risks linger, such as trade issues and Fed’s interest rate hikes. The government will strengthen its risk management, and will continue to work to improve the job market as well as the real economy through the 2018 economic policies and its recent measures aimed at increasing young adult jobs and stimulating the local economy.